Stop by the CUESA Classroom for a cooking demo featuring the seasonal bounty of the Ferry Plaza Farmers Market. 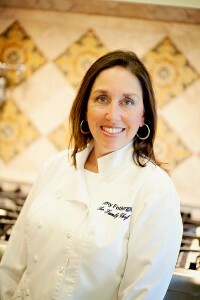 Amy has over 25 years of cooking experience as a restaurateur, caterer, and food service manager. She was trained at Cornell University’s School of Hotel Administration, a world-renowned, ivy league hospitality school. During that time she worked in restaurants and hotels in both the kitchens and front of the house. Now, as the mother of two young children, Amy has adapted her cooking knowledge to focus on healthy options. Amy realized she could help others since her strength lies in her deep culinary knowledge that not every home cook has. She prefers to use local or organic produce and almost always natural, grass-fed meats. The food she cooks is simple and simply delicious as well as approachable. Currently, she teaches cooking classes at select upscale markets in the Bay Area. She writes a blog on family cooking (with an emphasis on gluten-free foods), and pens gluten-free articles for examiner.com along with general articles for various newspapers and newsletters. In the fall of 2013, Amy published The Warm Kitchen, a cookbook featuring hundreds of gluten-free recipes anyone can make and everyone will love.